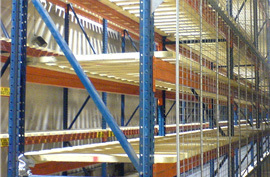 Pallet Racking Systems Ltd can supply various types of Pallet Racking Accessories. See below for more details. Pallet Racking Frame upright protectors cost effective protection for your Pallet racking frames. Protectors in stock to suit most makes. Close boarded and slatted timber decking for pallet racking to suit all types of pallet racking. Steel Shelving Panels to suit Pallet racking. The pallet racking anti-collapse mechanism is fitted to the rear of the pallet racking system. It is a simple and cost effective method of avoiding accidents in the storage & handing of pallets, also used to protect pedestrians working / walking below. Heavy duty pallet racking end barriers provide a pallet racking protection system to prevent potential damage that could be caused by the manoeuvring of forklift trucks.